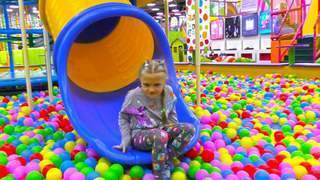 Yasya really knows how to have fun by sliding down fast into a sponge pit in this episode of her vlog for kids. Wearing her blue shirt and keeping her hair down, you will also hear her laugh happily as her mom throws some of the sponge cubes at her. Identify the colors of the slide that she goes on and watch her jump in the orange and yellow trampolines. Learning colors and having fun is possible at the same time with Yasya and her other videos that you can find at Kivitu.com.